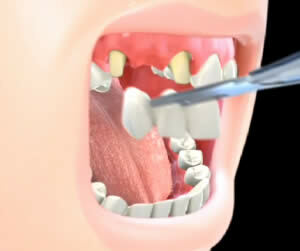 A dental bridge is a false tooth (called a pontic) used to replace one or more missing teeth. The pontic is centered between two attached porcelain crowns, to create a fixed bridge. The fixed bridge is permanently cemented to the two teeth on either side of the tooth gap.